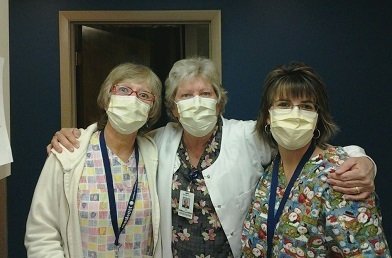 Nurses are required to wear face masks for refusing the flu vaccine. 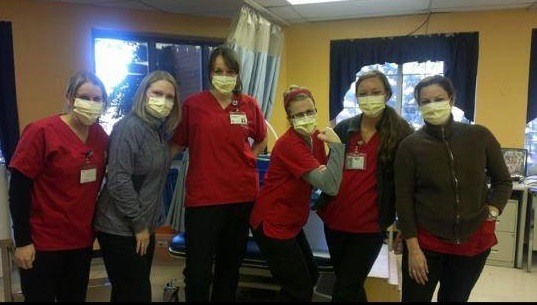 Photo from Nurses Against Mandatory Vaccines Facebook Page . And yet, hospitals across the country are mandating that healthcare workers receive the flu vaccine as a requirement to keep their employment. 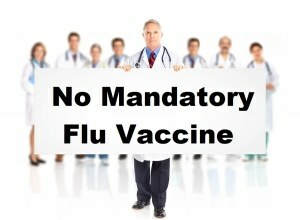 The main reason for this policy of forcing employees to receive the flu vaccine is not based on solid science that it protects patients (the science actually points towards no patient benefits ), but based on funding requirements for medical reimbursements  through Medicare and Medicaid, and through the Affordable Health Care Act, that require healthcare facilities to have a high compliance rate of employees receiving the flu vaccine. Photo from Nurses Against Mandatory Vaccines Facebook Page . Nurses, doctors, and other healthcare workers across the country are fighting back, however. This week, the Massachusetts Nurses Association sued Brigham and Women’s Hospital  in Boston to block a policy to require nurses to get flu shots as a condition of employment. 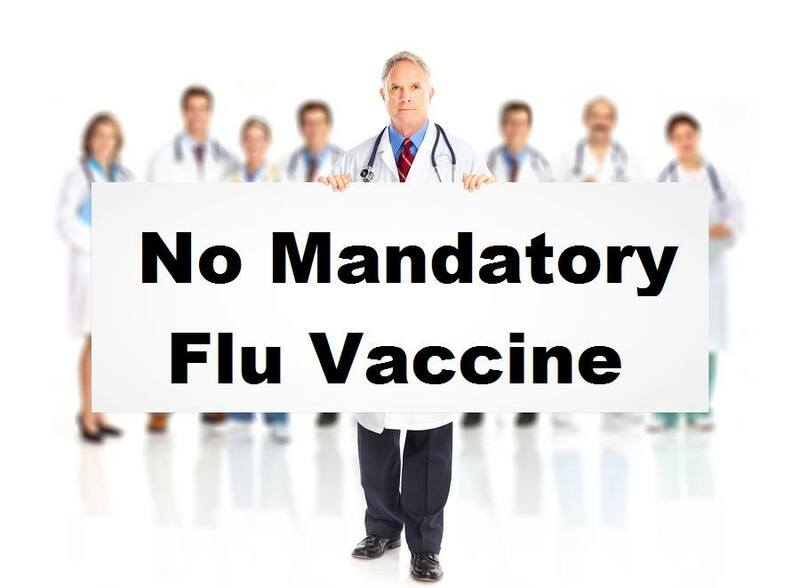 This past summer, the Vancouver Sun  quoted an emergency room doctor, Dr. Derrick Moore, as stating that he and 10 nurses refused to comply with mandatory flu vaccinations for healthcare workers at Nanaimo Regional General Hospital in Victoria B.C. Dr. Moore’s comments were made after the government claimed that only one healthcare worker refused to get vaccinated or wear a mask during the past flu season. That one person, reportedly an aide, was fired. Dr. Moore went public stating that this was not true, and that medical personnel all across Canada were refusing the mandated flu vaccines. “Their idea that Mr. Hoekstra was the only person in the province who wasn’t masking and was not compliant is certainly not true, and they know that’s not true,” Dr. Moore reportedly said. Dr. Moore is a physician with 24 years of experience. According to the Vancouver Sun , Dr. Moore stated that the health authorities in Canada were unable to pick on him and the nurses because of “strength in numbers” and the impact it would have on emergency room staffing if they were fired. Just a few days ago, Julie Sterns uploaded her video testimony to the Autism Media Channel  in the #hearthiswell  campaign . She is a registered nurse who has been practicing for 30 years. In this video above, she talks about the harm she has seen from the flu vaccine. She explains how her own daughter, also a nurse, was pregnant last year with her first baby, and the first grandchild in their family. Her daughter was forced to get the flu vaccine, however, as a condition of her employment, even though she was pregnant. Shortly after receiving the mandated flu vaccination, her daughter lost her baby. 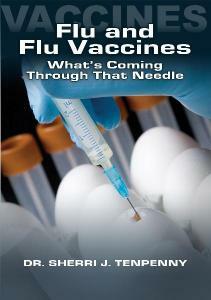 The vaccine inserts for the flu vaccine admit that they have never been tested for safety on pregnant women . She also talks about how good doctors and nurses who challenge established medicine are pushed out of their jobs, and threatened with losing their pension if they speak out. She challenges them to come forward and speak the truth. Indeed. 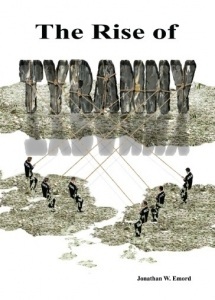 And that truth, it seems, will now be presented in a court of law in many cases.